I welcome you with joy as you are celebrating the 69th General Chapter of the Hospitaller Order of St John of God. I wish to thank you for what you are and what you do in the various expressions of your charism. I thank the Superior General for the words with which he introduced our meeting. And I would like to invite you to focus on three themes: discernment, closeness-hospitality and shared mission. Discernment. It is a fundamental attitude in the life of the Church and in the consecrated life. Making grateful memory of the past - as in today's Liturgy the Word of God invites us to do - to live the present with passion and to embrace the future with hope - the three objectives indicated for the Year of Consecrated Life - would be impossible without adequate discernment . Looking at the past, discernment leads to the purification of our history and our charism, to separate the wheat from the straw, to fix our attention on what is important. Looking at the past, we also arrive at the encounter with the first love. Looking at the present, discernment pushes us to live the present moment with the passion that must characterize the consecrated life, away from routine and mediocrity and transforms the passion for Christ into compassion, which is in step with the pains and needs of humanity . Looking to the future, discernment will allow you to continue making the charism of hospitality and care fruitful, facing the new challenges presented to you. Discernment is rooted in a historical dimension. I hope that this Chapter will remain in the heart and memory of your Congregation as an experience of dialogue and discernment, listening to the Spirit and the brothers and collaborators, without giving in to the temptation of self-reference, which would lead you to close yourselves in yourselves . Please do not make a closed army, a closed reserve, of the Hospitaller Order. Dialogate, discuss and plan together, starting from your roots, the present and the future of your life and mission, always listening to the voice of many sick people and of the people who need you, as did Saint John of God: a passionate man of God and compassionate towards the sick and the poor. Second attitude: Neighborhood-hospitality. Passion and compassion are energies of the Spirit that will give meaning to your hospital mission, which will animate your spirituality and give quality to your fraternal life in community. In a consecrated person, and in every baptized person, there can be no genuine compassion for others if there is no passion of love for Jesus. Passion for Christ leads us to the prophecy of compassion. May the cause of the human as a cause of God resound in you. And so, feeling a family, you can always be at the service of the wounded and sick world. In the midst of so many signs of death, think of the evangelical figure of the Samaritan (Lk 10: 15-37). He does not seem to have many means, he does not belong to any center of power that supports him, he has only his saddlebag, but he has a careful look and there, in the depths of his being, his heart has vibrated to the rhythm of the other . The urgency of reaching out to those in need leads him to put his projects aside and stop his journey. Concern for the threatened life of the other brings out the best of his humanity, and makes him pour with tenderness oil and wine on the wounds of that half-dead man. In this gesture of pure altruism and great humanity hides the secret of your identity as a hospital. In letting you get involved in the other and in the Samaritan's gesture of pouring oil and wine on the wounds of the one who had fallen into the hands of the bandits you will discover the mark of your own identity. A brand that will lead you to keep alive the time of the merciful presence of Jesus who identifies himself with the poor, the sick and the needy, and dedicates himself to their service. In this way you can fulfill your mission of announcing and realizing the Kingdom among the poor and the sick. With your testimony and your apostolic works, assure assistance to the sick and the needy, with a preference for the poorest (cf. General Constitutions, article 5), and promote the pastoral care of health. The Samaritan took care of the wounded man. The expression "taking care" has a human and spiritual dimension. Jesus wants us to touch human misery, that we touch his flesh in the flesh of those who suffer in body or spirit. Touch, to let us touch. He would do us so much good! And then your life will become an icon of God's mercy of mercy, finally becoming a compassionate and merciful Christ, who passed into the world doing good to all (cf. Acts 10:38) and healing all sorts of diseases and infirmities ( see Mt 4:23). In this context I ask you for a peaceful discernment on the structures. Your structures must be "inns" - like that of the parable of the Samaritan - at the service of life, spaces where especially the sick and the poor feel welcomed. And it will do you good to ask yourself often how to preserve the memory of these structures that were born as an expression of your charism, because they always remain at the service of the tenderness and attention that we owe to the victims of the social gap. I ask you to create "Samaritan" networks for the weakest, with particular attention to the poor, and that your homes are always open and welcoming communities to globalize compassionate solidarity. Third word: Shared mission. 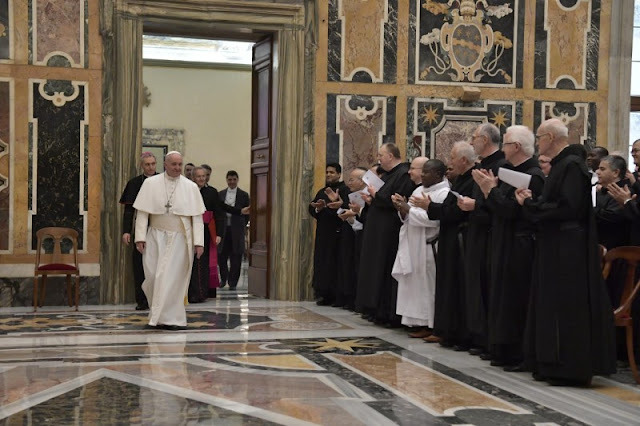 This is a real urgency, and not only because we are going through moments of scarcity of vocations, but because our charisms are gifts for the whole Church and for the world. Beyond the number and the age, the Spirit always arouses a renewed fruitfulness that passes through adequate discernment and increases the joint formation, so that religious and laity have a missionary heart that rejoices in joy in experiencing the salvation of Christ and shares it as consolation and compassion, running the risk of getting dirty in the mud of the road (cf. Evangelii gaudium, 45). I encourage you to take care of your formation, without neglecting to train the laity in the charism, in the spirituality and in the mission of Christian hospitality, so that they too have a good sense of belonging and in their works never fail the testimony of the spirituality that nourished the life of Saint John of God. Dear brothers, bring the compassion and mercy of Jesus to the sick and the most needy. Get out of yourself, your limits, your problems and difficulties, to join others in a caravan of solidarity. May your young people prophesy and your elders do not cease to dream (cf. I accompany you with my blessing; and please do not forget to pray for me. Thank you.